Dunlop is the largest supplier of original equipment and replacement motorcycle tires in the U.S.A. and the only manufacturer of motorcycle tires in North America. Right around Christmas time, Team Puerto Rico made good on their promise to use the money raised by their 2018 Motocross of Nations campaign to help those areas ravished by hurricane devastation. Three days into the trip, Jason Weigandt gave Nitro Circus ring leader Travis Pastrana a call for an update on how the trip was going. After the trip had concluded however, we were intrigued to learn more about the experience, so we once again gave TP a call to get a better understanding of just what went on during the trip. Long hours, hard work, and yes even a backflip ensued during their time on the island—because, well, have you ever known Travis to NOT backflip something at some point somewhere? We didn’t think so. 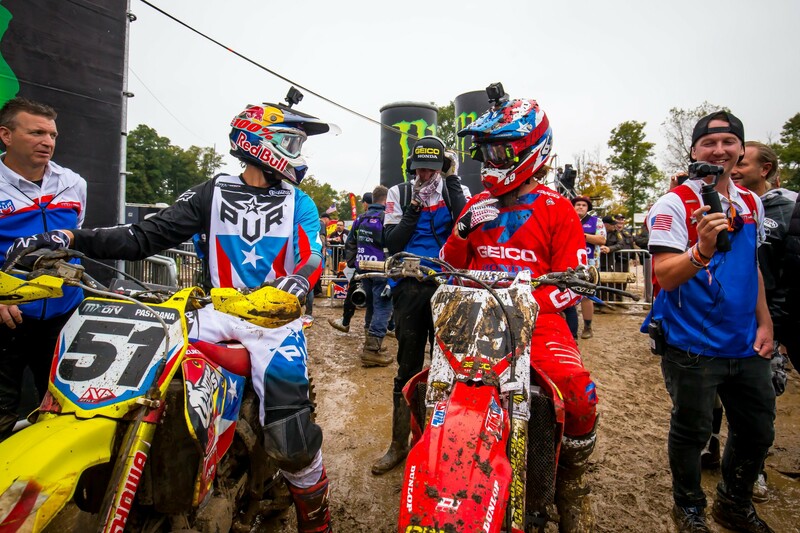 Racer X: You recently got back from Puerto Rico. Tell me about it. 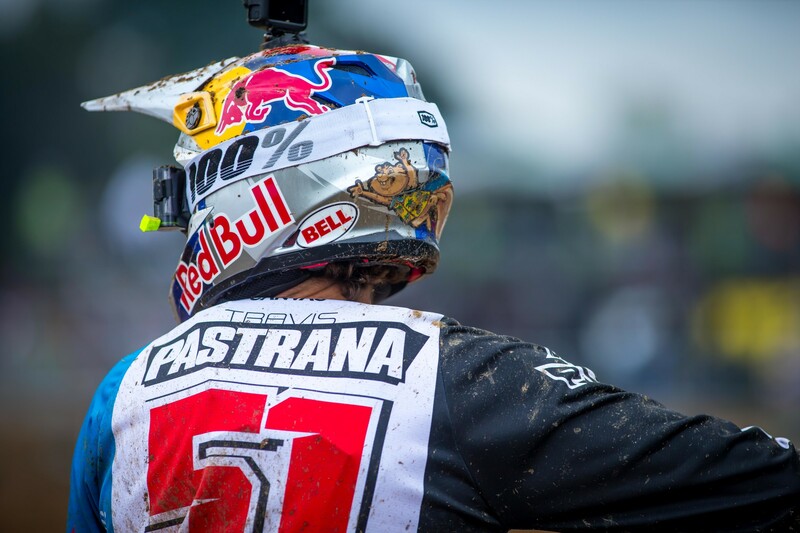 Travis Pastrana: It was really awesome. We had expected to go down maybe with five, ten people max and just really kind of work on some motocross tracks and do a ride day. At the end of the day when Gabby [Babriel Catala, Puerto Rico team manager] came to us from the Puerto Rican Motorcycle Federation, we started talking about this project and we just realized that the fun was kind of gone from Puerto Rico. As much as we feel like this is a sport, and it is, and a job for a lot of people it’s still a hobby that you do. The goal was just basically, the island got hit pretty hard. Everyone went into rebuild mode and now things are starting to run okay, but at the end of the day motocross is the last thing that kind of comes back and the extracurricular stuff you do when you’re surviving okay. You have fun. So that was kind of the thought process. Honestly with Ronnie Mac on board at Unadilla, we raised more money over the next two days when Mac was on board than we did with [Kevin] Windham, myself, and [Ryan] Sipes for the rest of the time. It’s just kind of that wild, what the heck is going on? Sold probably $28,000, $26,000 dollars of merchandise, which we sent a check straight down that Wednesday to the Puerto Rican Motorcycle Federation and they used that money for two riders that were actually from the island to go to the Latin Motocross of Nations, which they wouldn’t have had a chance to race in. So I thought that was cool just to start with. We ended up going down with just over 40 people. Is that how many people you expected? No. We had expected less than ten. We had expected to maybe raise $50,000 total where we raised for everything probably around $350,000. At the beginning it was just going to be, we’ll just sell merchandise, and then people wanted to help. Road 2 Recovery got involved and really raised some money. We had some awesome sponsors. cbdMD jumped in. They even jumped in after the des Nations. They jumped in after it was the most beneficial for them, which was just awesome that people really wanted to give a little fun back. We didn’t change the world down there, but we put roofs on three homes. One home specifically, her name was Maria. Single mom with a couple kids and was sleeping on the floor at a neighbor’s house since the hurricane—Maria. Retiled the floors that were all just rotted away and put a roof on the house and got the electricity working, which she was pumped about. It was really cool. Then we worked on two other houses. They were just basically getting the roofs so they didn’t leak, so they had dry areas to sleep. It was really rad. Nate Wessell was down there, Trevor Piranha, who is just a jack of all trades. He was awesome. These guys built stuff that couldn’t be built in places that couldn’t be fixed. Those guys just went to work and made it happen. We went to a school, and the school area normally held a little over 200 kids but the three other schools in the area shut down, so it was up close to 400 kids. So we brought pizza for all the kids, which actually they were more excited than anything else. They had one computer in their library, and we donated three more and some other stuff the teachers had requested that they were a little short on. Then in a matter of 15 minutes, those guys built me a backflip ramp just out of the extra wood from the houses they didn’t use for the roof and I did a backflip in front of the 400 kids. Just a really rad time. Then Ryan and I went back to Gabby’s track and we rented two dozers, which we left down after for them to kind of finish it up, but really got that restarted. It was just a bunch of completely grown over, just a field. Cool that they’ll now have probably the best track in Puerto Rico. That will be back running here really soon. Had a ride day at another track that was super rad. We said, 9:00 we’re going to start, and at 7:30 there were 100 riders there. So it just goes to show you that they’re ready to be back riding and have tracks back up and have some fun. Talk about having Nate Wessel on board. I know that he’s been super involved in building basically everything you guys jump, hit, whatever for Nitro. Talk about his role there and what it was like to have a carpenter, builder of that caliber down there on board with this program. That was the thing. Wessel heard about it and he was like, “I’m down. I don’t care.” Woodward said, “Hey, you got to get all this stuff done,” which literally it was going to be full days for him to get it done just to finish before the Christmas break. He worked literally 18 hours a day for two weeks straight to take his own vacation to fly himself down there, literally pay for his flight down there just to be a part of this. That was freaking rad. Greg Schnell, he’s part of Global Disaster Outreach. He goes and rebuilds stuff. Those guys, not really being paid to go down there, funded basically the place where everyone stayed and stuff for the guys that came down out of the money we raised, but those guys all came down, all construction crew, and just never stopped working. Twelve-hour days plus. They didn’t even want to stop for lunch when we brought them lunch. It was just unbelievable. Just to see guys like Greg who were in the moto industry that now are in construction, and just said, “Yeah. This is an awesome cause. I know some guys that are going down. Let’s make it happen.” I didn’t even know he was coming until I saw him there. I was like, “Greg? What are you doing here?” But Global Disaster Outreach, those guys brought a pretty big crew which was awesome. Like I said, just really cool guys. Ryan, who runs that, was good friends with Ryan Sipes. He was friends with Sipes and asked him about this project and they really ran point for us, them, and Bill with Nitro, on just lining everything up. He went down there early to scope it out for a weekend and then flew back down there two days before we did just to make sure that when the 40 people hit the ground, that we could all hit the ground running with different projects. So that was pretty rad. Are there still guys down there working now or are you guys going back later? What’s the deal with that? Basically when this documentary sells, the DVD or whatever platform it goes on, a good portion of that money will also go back. Basically anything that’s above the expenses that Nitro had will go straight back to Global Disaster Outreach, with the first thing going to get a new water truck for the track. We had our ride day and they were like, “Yeah, we got a water truck.” Everyone was out there working on it and trying to fix it. Every time it got running, something else would break. I’m like, all right, guys. This should have been first priority. It rains down there enough, but definitely that’s priority one and then go from there. You spent a total of eight days down there. Can you explain to people what the living conditions were like when you guys were down there? I don’t think a lot of people understand just how gnarly it is down there. I guess it’s like anywhere else, but when they got hit with the hurricane, the people that couldn’t afford to rebuild just didn’t rebuild. So the cities are pretty good right now. It was funny, we came to a light that was still out and then the next day it was back in. It was not too far out of the city. It was funny because the guy was like, “It’s the first day this light’s back on.” Just stupid stuff like that. The further you go out of the main towns, roads are washed away. Like going to Maria’s house, you have two or three families living in one house, two or three school districts in one school. They get by and the kids are okay. The floors are wet and it’s moldy and you don’t have roofs. The roofs are literally just tarps still. It’s what I would call unlivable, but they adapted and it’s just kind of the way of life. It does feel very much like India or a third-world when you go over there. I agree. There’s places like that. My mom works as a Second Language teacher at Baltimore city and they don’t have air conditioning. That’s just right in our backyard. It’s 110 degrees in there for two months or a month and a half in the summer. But this was an awesome opportunity for us to go down and really just bring back a little bit of fun, was kind of my goal. We’re not going to change the world, but we really hope that this will also raise awareness and some other people will go down. It’s beautiful down there. There’s waterfalls and awesome swim areas and such nice beaches. Just go down, spend a little time. I didn’t even realize we got a Southwest flight down from Baltimore, it’s three and a half hours. The water is 83 degrees in the ocean. You’re like, this is awesome! While you’re there, just give back a little bit. It was really cool. I think there’s been a lot more people whose eyes kind of got opened. Hopefully it inspires others to do stuff as well. What was the Puerto Rican government’s receptiveness to you guys coming down? Were they super receptive like, “Oh, sweet. We’re going to put this money to good use?” Or was there any resistance at all on the political side of it, or was it pretty good? We didn’t do anything with the political side. We went directly to the people. We went door to door in the areas hit hardest two months before we got down there and talked to the neighborhoods and figured out who needed help, what schools were the most needing. We didn’t go through the government at all. However, the mayor of the town that we spent most of the time in, he came out and was awesome. They did some interviews for the documentary and they actually gave out a little bit more aid. It was really neat. The three houses in the neighborhood we were working on, when we came in the first day no one was working on the other houses. By the last day everyone was like, “Oh, they fixed their roof.” They weren’t doing much, but everyone kind of got back to we can rebuild now, and doing what they could to kind of chip in. If nothing else, this little community just outside of San Juan was kind of motivated to live a little better, and we hopefully helped them do that. You mentioned that you guys ended up having a group of 40 people. I’ve hung out with you dudes enough to know that it’s organized but yet unorganized. Were you guys kind of structured, or was it kind of like a free-for-all, typical Nitro style? No, it was way better than anything Nitro has done, honestly. Obviously, Dov Ribnick was in charge, but honestly the cbdMD guys when we came down we were like—and Global Disaster Outreach—“It would be good if we could do this. Now that I’m down here, I wish we could do this.” So Ryan went down a couple weeks early to just really get everything in place and talk to everyone and make sure everyone knew what was going on down there. When we were coming, what we were doing. Not telling what we were going to do, but just ask what Maria needed to get back in her house and stuff like that. cbdMD came down with a crew of ten people and they helped out so much. I thought they were just coming down to kind of lend a hand when needed, but they were on it. Anything we needed from the stores, from whatever. When the mayor came he was like, “We got a lot of homeless people in the area that could really use the basics. Socks, underwear, diapers for kids, this and that.” cbdMD went and bought literally thousands and thousands of dollars of just the basics to give out to the homeless in the town. It was super cool. The government, that organization organized so everyone that was on welfare or whatever knew that it was there. We had a line of 200 people outside waiting for stuff. So it was just amazing how much really came together and how well-organized it was for sure. I know it was a serious trip, but I also know you guys like to have a lot of fun. Is there any cool, fun, interesting stories you can tell us about? Or we just got to wait until the documentary comes out? To be honest, it was a work trip. We always have fun. We rode dirt bikes and tested out jumps and kept digging away on the tracks. We went to one track and we weren’t even going to go to the next track on the other side of the island and they were like, “Hey, it’s open tomorrow.” A lot of the guys can’t make it all the way across. So Sipes and I went over and it was just so much fun. I jumped on some dude’s silly quad and did some laps around there. Mud bogs and drag races. It was pretty rad. That was the only track that was really going until we came down there. It wasn’t much of a track, but it was cool. Something for people to do. I think the coolest thing was probably after the ride day a family said, “You guys have to check out these waterfalls.” We really didn’t have enough daylight, so we actually got stuck in the middle of the rainforest completely pitch black just with our iPhones trying to figure out how to navigate back out of the rainforest, but got to a waterfall and jumped into a big water area. It was just a rad, rad country and cool people down there. Everyone was willing to help out and to show us a good time. Super cool. Whenever you start with Ronnie Mac, I realize what’s going to happen and everything. I was hoping kind of optimistically. We had already filmed a lot and done a lot. It was going to be a really, really rad, kind of a documentary if possible but a mockumentary if you will but it was meant to show motocross and this stuff in the most positive way possible and just show how great the top riders really were. Obviously the goal changed from trying to kind of win the B main, but not getting in the way of the A main. So when Windham came on board, and it was still going to be a tough deal to make the A main, but with Sipes and Windham, I was like, as fat as Windham and as much as he’s been off the face of the earth, it was cool that he got and understood what was going on. He was like, “Hey, man, you owe me one.” Then when we got there, Kevin said it was the greatest day that he’s ever had. I think that’s because of the people. Anyone who was at Motocross of Nations that saw the reaction—if you look at any picture and you look at the people around, everyone was standing and cheering every single lap no matter how far back we were, no matter what position we were in or what was going on. It was the loudest the crowd has ever been for me. It was the loudest the crowd has ever been for Windham. You could tell when Sipes was on the track, where he was at any point. I feel like every country came together and really supported Puerto Rico, which was just a really, really rad experience. Definitely a great send-off to a career. When you look back at Motocross of Nations and all the pain you went through to get ready for that, and then now that you’ve been down to Puerto Rico and you got back, do you feel like it was all worth it? Would you have done it all over again the same way? That’s a tough question. Yes and no. After it was all said and done, it was probably one of the greatest challenges, greatest experiences, greatest rewards, biggest contribution that I’ve personally ever been able to make, whether people see that or not. Just for those few families down there and for the tracks and everything and getting the community back riding, that’s rad. That’s something that my mom does a lot of. I’ve tagged along to different trips, but never been able to make an impact of that magnitude. Never had that much support. For Windham, he couldn’t have been more stoked. He wanted 2014 as his send-off year and he just got hurt and wasn’t ready so he just pulled out of that. He was like, “I’ve never done my send-off. This was the greatest send-off that any rider’s ever gotten.” To be part of something that he believed, I believed was a positive, I think was rad. So I definitely knew that the racing was going to be tough, knowing how injured I was going to be before and how muddy the track was going to be and how good those guys were in the mud. That was embarrassing. I really honestly believed that I could have done a lot better. I was looking forward to that track with outside sand berms and to just rail. I had the fastest 250 ever made. I really didn’t fulfill what I was hoping to do on a personal level for the race, but everything else exceeded my expectations times ten. Is there anybody you want to give a shout out to and thanks for being on board with this project? The whole entire motorcycle industry. Even the military guys came down. We had JT with Black Rifle Coffee. He came down and organized a helicopter ride for a couple of the guys. They did fly-bys at the track. Just everybody came out to have a good time and hope to make a little bit of a difference. Those guys worked their butts off. It was really rad.